The C-Brats :: - Cockpit Seating: Could this work on a 22' C-dory Cruiser? Cockpit Seating: Could this work on a 22' C-dory Cruiser? Posted: Sat Feb 09, 2019 3:27 pm Post subject: Cockpit Seating: Could this work on a 22' C-dory Cruiser? Hello- We just read that the cockpit is 4"6" long in the C-Dory 22 cruiser. Couldn't one just mount four swiveling pedestal seats back there- two on each side so you can use one for a leg rest for lounging about and then have four seats maybe with a removable table in the middle for eating, playing cards when company is aboard? Or does something like that compromise the safety of the boat due to weight? Not sure what seats you have in mind--there are some expensive seats which will semi recline--but the cheaper ones are more designed for sitting upright. Portable foot rests would make sense in that case. You have to be sure the cabin door will open and close. You have to be able to safely move around the cockpit. 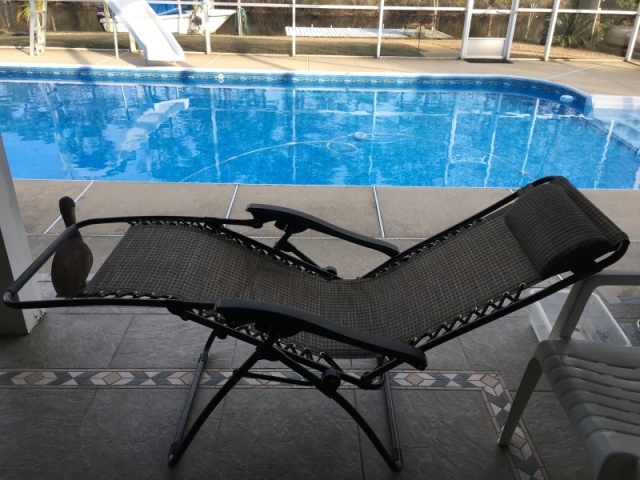 There are always solutions --maybe two chaise lounges like I use on my RV--can be folded up flat, yet will fit in the cockpit of my C Dory 25 (4’8″ long x 7’1″ wide)--and probably in the 22 angler, not the cruiser--maybe if fore and aft in the 22 cruiser? . Steel frames, and mesh support. Easily moved. Very comfortable and very sturdy. The first is 48" from foot to head of frame. The second and more reclined, is 60" from foot to head frame. But, not a lot of room left in the cockpit: The floor imprint, is about 25" x 28". They fold to about 4" easily. It is possible that the foot part (or head part) could be higher than gunnel. Most all of us carry folding chairs to use on the dock or shore. We spend much of our "lounging" time there--as well as at gatherings. We also have a tarp/shade by Kelty which is 9' x 12' and will shelter a number of C Brats at gatherings. 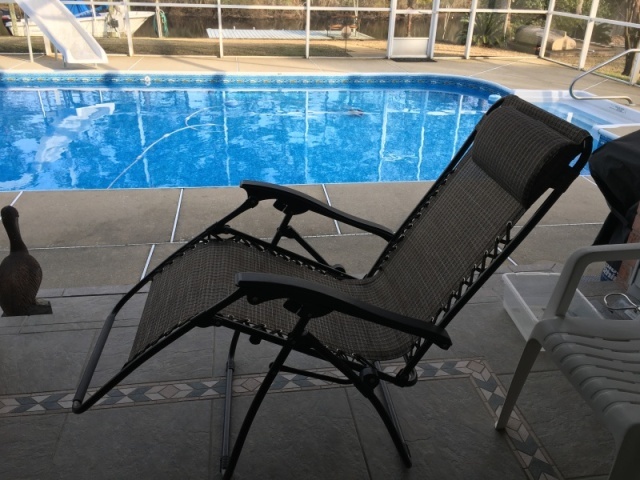 Some of the "reclining' canvas folding sling back chairs, are very compact, and you may want to look at REI or similar supplier for that type of folding chair. Bob, Thanks for the ideas and letting us know we would have difficulty doing a pedestal instal.. Do you know how high the sides of the cockpit are. Another concern for lounging is not being in a hole. Coming from a sailboat and being used to seeing the water while lounging, being able to find seating to replicate that is important to us. I can't imagine not having a place for family to sit in the cockpit comfortably, especially when we would not be staying at marinas often. I see there is no place to secure a bolster if we wanted to use a boat bench. Can anything be permanently mounted to the sides if we found a bench with backrest? Yes, bolsters are common in fishing boats--and could easily be fitted to sides of the cockpit combing of the more modern boats. For the 1982, it could also be done. There would have to be a little modification. Remember the "human ergonomics of comfortable seating--and many boat seats are not comfortable. So you have a platform to develop comfortable seats. Not sure how big a family or ages, But one family of 5 (3 teens and a Golden Retriever) cruised in a 22 extensively. Some slept on land, some in the cockpit. With the shoal draft, there are so many places the boat can be within stepping distance to the beach. At Lake Powell, most of us anchor stern too (a few Bow too), but we step into dry land from the swim platform. That is why we do much or our sitting on the beach. Do you know how high the sides of the cockpit are. Another concern for lounging is not being in a hole.
. The head frame is still over 31" off the "surface when fully reclined. I believe that the gunnel height is less than 31". I feel that they would always have the head above the gunnel level and allow for excellent views. There may be both aluminum and steel frame models. If you boat only in fresh water, the steel (with greater weight may be OK--but if in salt water, I probably would go with the aluminum. In either case, keep any blemish covered up with paint, to avoid corrosion. All of these chairs have the webbing fairly easily removable to allow repainting. ... Do you know how high the sides of the cockpit are. Another concern for lounging is not being in a hole. Coming from a sailboat and being used to seeing the water while lounging, being able to find seating to replicate that is important to us. Not to be a wet blanket or anything and no offense intended, but perhaps you need to accept the C-Dory for what it is and not expect it to be an emulation of a sailboat. A C-Dory will get you to a lot of places a sailboat won't and in a lot less time. You can actually drive it while sitting in relative comfort at a decent speed compared to a sailboat (i.e. sitting in a warm cabin at 20 mph vs. standing outside in the weather at +/- 6 knots). Being able to access water that is 2' deep vs. 6 or 7' is something that some people find a big plus when it comes to C-Dory boats. There is also the whole heeling thing that doesn't occur in C-Dorys. Don't forget about being able to sit at your dining table and still being able to see outside of the boat. There are other examples of the differences between the two kinds of boats. All boats are trade-offs. Perhaps you are trading a cockpit that allows lounging against being able to cruise in a comfortable cabin, speed, and the ability to traverse relatively shallow water. Only you can decide what attributes are most important to your use case. However, if a large cockpit that allows lounging and socializing are the primary factors in your boat decision, then maybe a C-Dory is not the best choice for your application. Perhaps a pontoon boat might fit the bill though. For sq. ft/$, it is hard to beat a pontoon boat, but it depends on where you intend to use it. We really appreciated the great ideas from everyone and for pointing us to photos of mods. Having owned many boats, we are well familiar with how ever changing lifestyle needs and wants factor in to choice. The C-Dory is so well loved and seems so well made that we have to consider it at this time in our life. We are still weekend cruisers for about six more years. We are also seriously considering a C-Dory because of this wonderfully supportive C-Brats group where it appears the majority are genuinely nice people interested in supporting others. All boats, except same brand are apples to oranges comparisons because there is so much to consider from a personal perspective, whether encompassing one person or each family members needs, wants, comfort, etc. From recliners to built in storage and seating to coolers with bench seating, you came through and I feel confident we could use that space to create some nice lounging. Many thanks. Removable (Higher Quality, Marlin brand) folding chairs is what we always used in the cockpit of our 22. Advantages of these includes: take them ashore while beaching, move them around for sun or shade, leave them out or fold them up if extra space is needed, put a cooler between them for a little table or a foot rest, etc . Pictures somewhere in our album as to how they look. It's something in the water! We use these folding chairs. As mentioned, they can be moved around as necessary, used off the boat, and stowed when not needed. Got them on sale for 1/2 price as one of WM's weekly specials (which seem to have gone away).